Hiya guys! I have some nail art to make you feel fancy today and no not the Iggy kind of fancy. We are so over that. Today I am sharing some black and gold bow-knot nail charms from Born Pretty Store. I don't know about you guys, but I feel like Born Pretty Store has really stepped up their game when it comes to nail charms (and stamping plates/polishes). There are so many cute ones to choose from and personally I am obsessed. I just feel like charms in general give a mani just a pop factor! Now I know it's a very simple manicure, but that's quite alright when it makes you look this blingy so effortless. 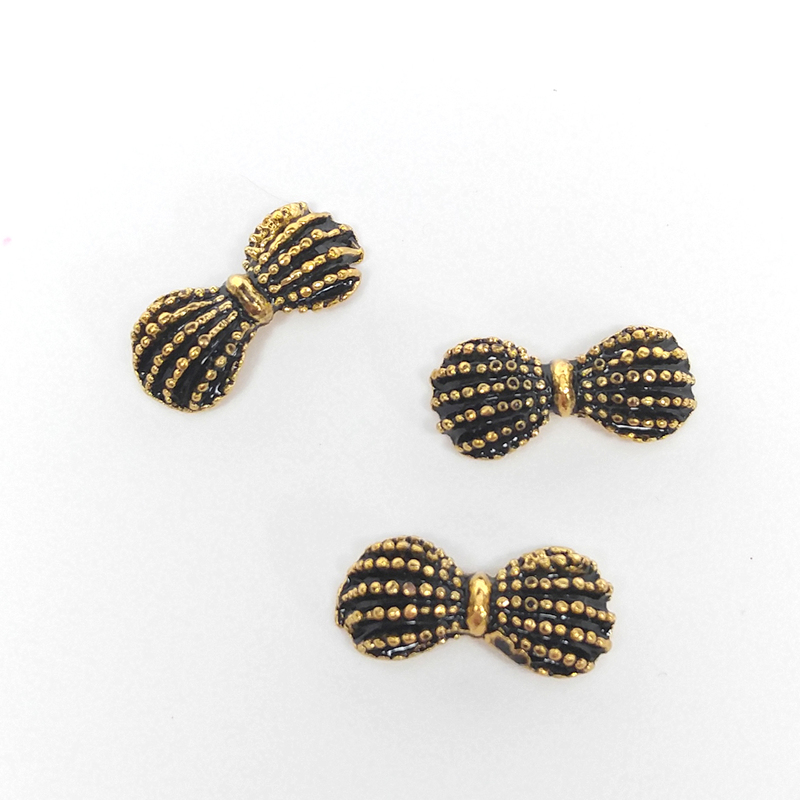 The Nail Bow-Knot Charms are listed in the Born Pretty Store as item #21397 and it's pattern #10. Each purchase includes 10 of the same charms and retails for $4.02. 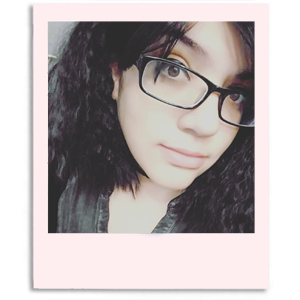 These ended up working perfectly for me, they were almost my exact width so I didn't have any problems wearing it. I can see these being a bit much for someone with smaller nail beds though, they kind of tend to overwhelm your nail. I applied the charm with a bit of topcoat since I was only going to wear it for a day. For longer wear time I would definitely recommend nail glue. 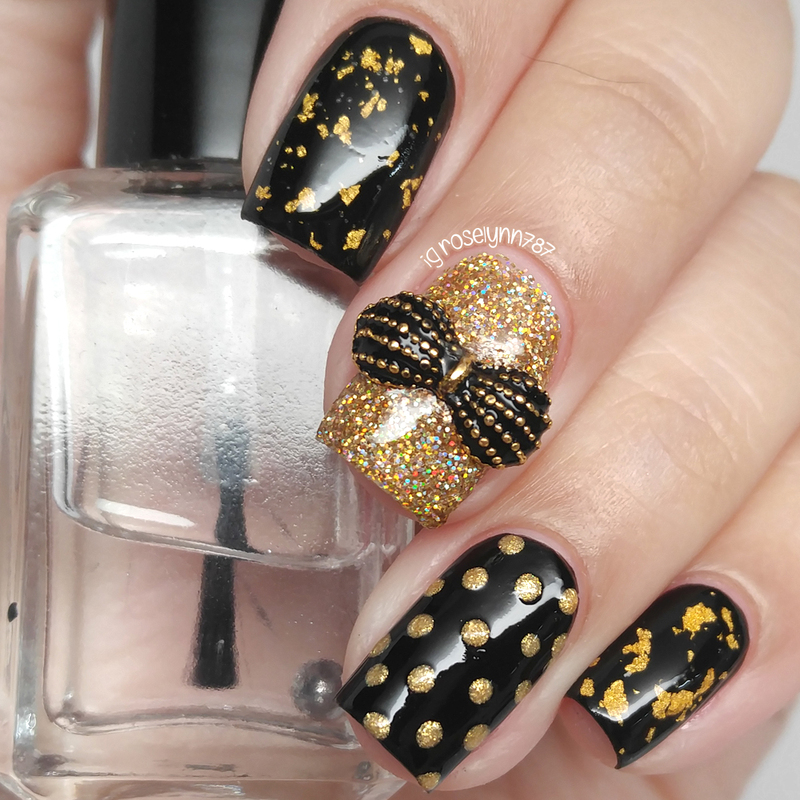 There is just something about gold and black that make such a sophisticated combination. I actually ended up redoing this manicure quite a few times because I kept feeling so dissatisfied with the overall look. My other attempts looked nothing like this, there was a lot of matte and weird negative space. Sigh. It was a classic 'when good ideas go bad' moment for sure. In the end, I decided to just dial it all back and stick to glitter. Cause if it sparkles then dang it, it freaking works for me. There is no YouTube video to go along with my mani for today because I just felt it was too simple. But, like always, if it's something you'd like to see anyway I'll be happy to put something up. For this manicure I whipped out an oldie, but a goodie (and one of my favorite all time polishes) Zoya's Gilty. This gold flakie polish was layered over BBP Little Black Polish and sealed with a glossy topcoat. 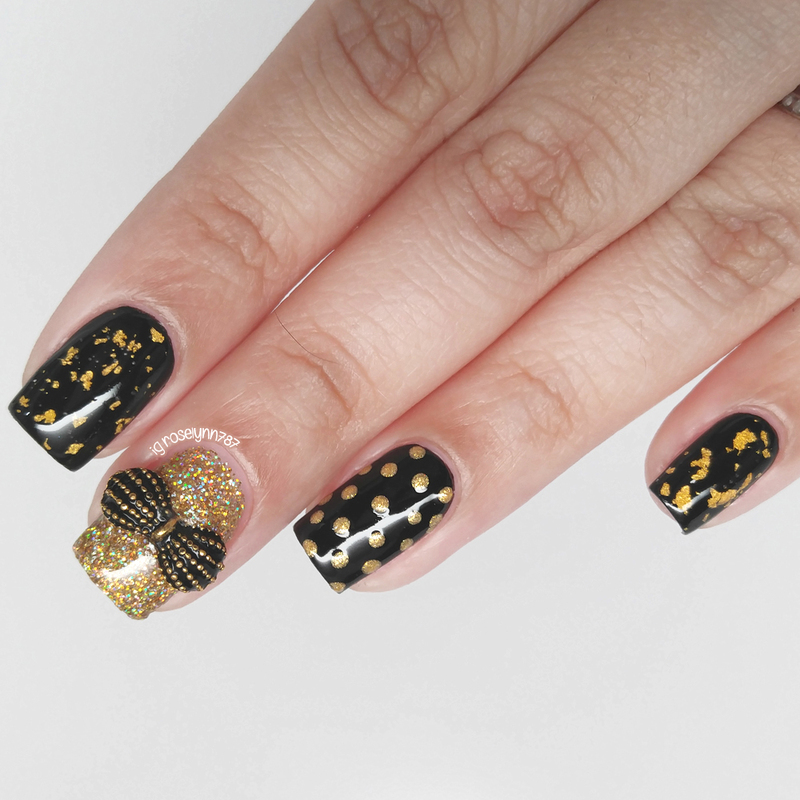 The middle accent nail is another favorite of mine, the beautiful gold glitter Noelle from Daily Hues. As always, if you'd like to shop over at Born Pretty Store be sure to use my code ROHH10 (note: this coupon code is subject to change within the next few days, I'll let you guys know when it changes over) receive 10% off your purchase. And remember shipping is overseas and will take at least 2-3 weeks to arrive. This is so cute and classy, love how sparkly it is! This is gorgeous! I completely agree with you they have really stepped up their game. The charm added a nice touch. 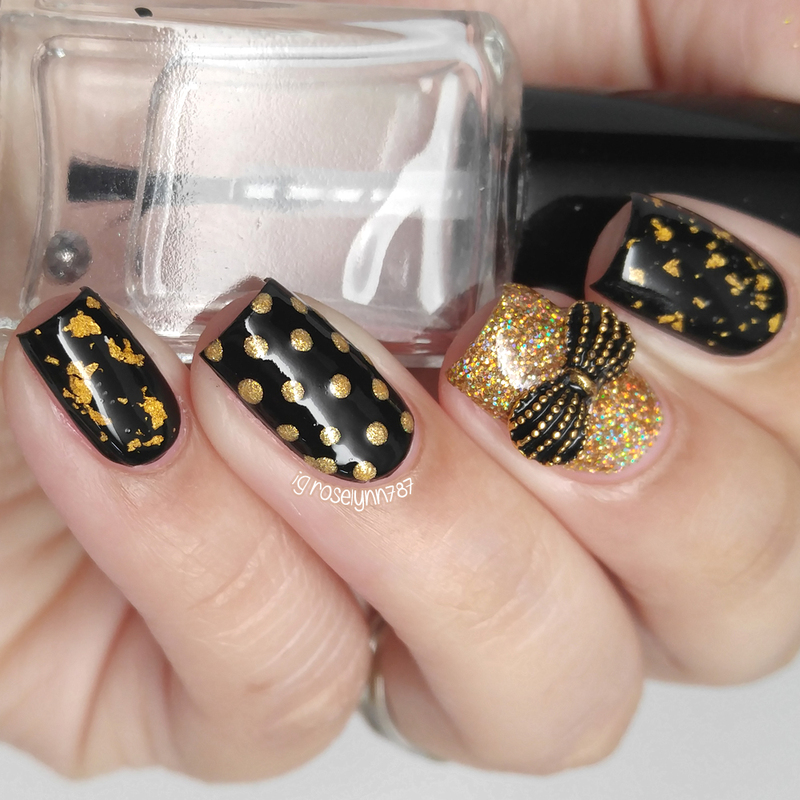 I love black and gold together too! I don't know if I like the charms on their own, but I absolutely love how you've incorporated them into this look. Perfection! Freaking love it. It's perfect. I adore this! Such a classy combo!